Makan, minum, and talk cok. Such simple and enjoyable activities of a Singaporean. It was my first meetup with this fine group last night. Thanks to Mohsen for organising it! 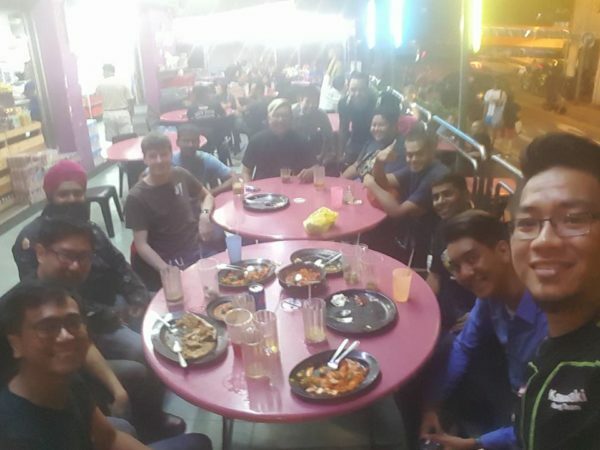 The group met at Adam’s Corner @ 452 Serangoon Road. Great turn out and met many new friends. Chatted away with the group of biking fanatics. Many of them have also upgraded from the Pulsars to bigger and meaner machines. But the friendship and bond seem to remain. Angad also inspired me to do the Renggam via the Layang-Layang route. It’s but a mere 1.5hrs from Singapore. Perhaps Sunday breakfast? Hi do you know where can I get sports fairings for pulsar? Hi Ziv, I honestly have no idea. Try searching for it on Carousell or the Pulsarians Singapore Facebook group? I’m assuming that you’re from Singapore? Personally, I hate the idea of fairings – it spoils the looks of the otherwise gorgeous naked bike. Consider getting the RS200 instead? Previous Previous post: Oil Level Inspection Window Clear Again!